The development of appropriate social skills has many components. Look here for worksheets you can use to develop social cognition and recognizing emotions. Don’t always wait for someone to talk to you. EVERYONE needs to take a turn at starting a conversation. Start talking to someone – it they want to talk about what you said, they will take a turn. Pay attention when another person talks to you. Listen so you know when you should take your turn. People build a conversation together. Listen to what the other person is saying and add to that topic. What you say should be about what the other person just said, unless you are both done with the topic. If you don’t understand what the other person said or meant, do not pretend that you did. Ask for clarification. Take your turn deciding what to talk about. It is your responsibility to hold up your end of the conversation! How to be Cool results of a study with a real group of teenagers tasked with defining COOL. Part of having self-confidence is knowing that you are ‘okay’ even when you receive some negative messages from peers. The How to Be Cool handout lists different aspects of ‘cool’ including speaking up for your self and not being afraid to be different. 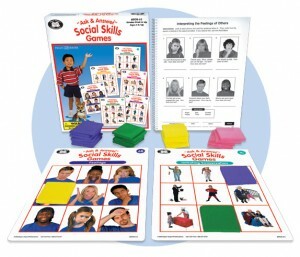 Social Skill Areas Definitions and criteria of the 4 social skill areas followed by specific social skill situations for elementary, junior high, and high school for home and school situations. Purpose: to provide a structure for goals and role-playing discussions to practice social skills. Part 300 / D / 300.304 / c / 4(4) The child is assessed in all areas related to the suspected disability, including, if appropriate, health, vision, hearing, social and emotional status, general intelligence, academic performance, communicative status, and motor abilities. Children with hearing loss are a very diverse group. When most of the students we served were functionally Deaf and educated in center-based programs the Meadow-Kendall Social-Emotional Inventories that were normed on this population were very appropriate to use to assess these areas of need. Now most of our students spend the majority of time in the mainstream and it is most appropriate to compare their social/emotional needs to those of their typically hearing class peers. Thus, this long-used assessment should no longer be the ‘go to’ for most of our students. So what can we use? When school psychologists perform a social/emotional assessment the usual areas of need they are most likely to identify are impulsivity, lack of ability to attend, depression, or non-compliant behavior. Although our students can experience these issues, the hearing loss may cause behaviors that suggest these issues but the behavior is due to hearing loss and not other issues. For example, if the teacher completed the Connors Behavior Rating Scale a student with hearing loss may seem off task and inattentive when the real reason is fragmented hearing and not receiving all of the information, or excessive effort to listen resulting in periods of distractibility. Likewise, the Behavior Assessment System for Children may identify a child as depressed, when instead the student is hyperfocused on trying to get information auditorilly and visually and seems to have little affect or interaction. Created by a team of researchers, artists, and game developers, Zoo U is the only research-proven online game that assesses and improves children’s social and emotional skills. o Developed with funding from the US Department of Education. Zoo U is geared toward students in grades K through 5 and can be administered to one child or to many children at once. Because the assessment is a game, children stay engaged and motivated. In Zoo U, players are students in a school for future zookeepers, where Principal Wild and a host of friendly animals help them learn social and emotional skills as they navigate common school-based social scenarios. Educators can sign up for a free trial of Zoo U. 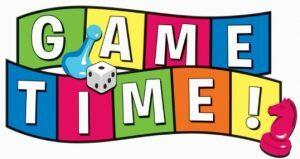 Find out more about the Zoo U games. The key is the need to have someone on the evaluation team (YOU) who can discuss the results of these measures with the team in terms of the ‘DHH Lens’. Adding teacher checklist information about specific behaviors that are of most concern for students with hearing loss and discussing the results with the evaluation team in addition to other testing performed can help you to ‘make the case’ that there may be more social and emotional challenges than are easily identified by using standard measures alone. 1) Social-Emotional Assessment/Evaluation Measure is completed by parents of infants, toddlers and preschoolers (up to 66 months). Preschool teachers can also complete the form. 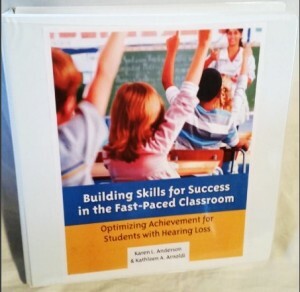 It is most useful if parents/teachers review skill development and identify areas of concern over time. 2) Social Language Development Test is a norm-referenced test that delves into pragmatic language use, social cognition, making inferences, peer negotiation and multiple interpretations of social information. Grades 1-6. Low performance in any of these areas is likely – in combination with hearing loss – to impact social interaction. 3) Pragmatic Language Skills Inventory is a teacher checklist that can be completed in 10 minutes. Great psychometrics allow this Inventory to be used to identify functional social language issues. For children ages 5 through 12. 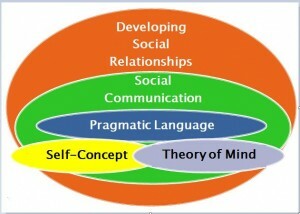 It has 3 subscales: Personal Interaction Skills, Social Interaction Skills, and Classroom Interaction Skills. 4) Children’s Peer Relationship Scale can provide very useful information about how isolated or integrated a child feels. Although it is not normed, this data can add insights to the results of other test measures. 5) Children’s Loneliness and Social Dissatisfaction Scale is designed to assess children in grades 3-6. Simple to administer and score, this scale has psychometric properties to identify students who are socially rejected and/or who feel lonely in regard to their school relationships. 6) Does this student have a poor self concept? This checklist asks the classroom teacher or the DHH teacher in discussion with the classroom teacher to consider 15 behaviors. All items are presented negatively, such as “Expreses feelings of not belonging” or “Gives up easily.” This checklist is not normed but can provide very important insights to consider in addition to other assessment information. 7) Think About It Quiz is a checklist for teens to assess self-concept. It asks the teen to judge themselves against their peers in five different domains, including peer acceptance. There is a cut off score to identify areas of concern. 8) Social skills checklists can also be completed by the teacher, such as the Social Skills Checklist (Pre-K/Elementary), Social Skills Checklist (Secondary) and The Social Attributes Checklist. If we truly tailor assessment so that the vulnerable areas of development specific to the access issues of hearing loss are considered AND we examine functional performance in a classroom setting (or predictive measures) I believe that most children with hearing loss can be found to be eligible for specialized instruction and related services. Refer to Steps to Assessment for case examples and specifics on assessment.